Opioid overdoses are a huge problem, but there is a temporary antidote, naloxone, which is being increasingly made available for emergency use. A naloxone injection counters the effects of overdose for around twenty minutes, giving time for medical help to be summoned. 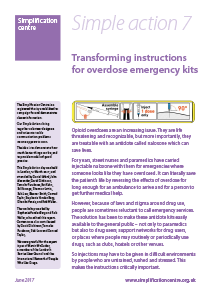 Naloxone kits may be used by untrained people, so the instructions are critical. We got together to review the instructions for one kit used widely in the UK, and show how much better they could be. If your car is caught by a speeding camera, you get a ‘notice of intended prosecution’ in the mail, asking you to confirm who was driving. It’s a confusing document, poorly written and poorly laid out. Yet failure to respond could result in a fine or more penalty points. We wanted to see if the template we developed for Simple Action 1 would also work for this document. 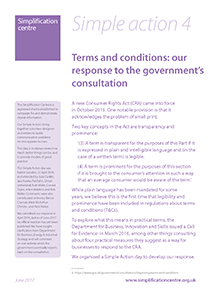 A new Consumer Rights Act (CRA) came into force in the UK in October 2015. One notable provision is that it acknowledges the problem of small print. In March 2016 the Department for Business, Innovation and Skills issued a Call for Evidence looking for guidance about how to make Terms and Conditions more usable, so we held a Simple Action day for put together a Simplification Centre response. Tenancy agreements are important documents, but they are surprisingly varied in content, language and design. 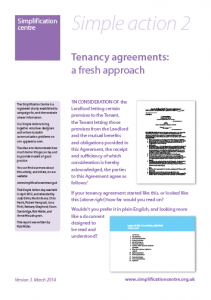 There is currently no standard (although the UK government has recently announced it is working on a model agreement), so we spent a day rethinking tenancy agreements. In this report we show two proposals, both easily convertible from conventional agreements. Both of them see the primary audience as the tenant and landlord, rather than the law court they might end up in if the relationship goes wrong. 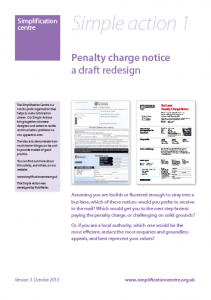 If you drive in the UK, the chances are that you will have received a Penalty Charge Notice at some point (if you haven’t, well done). If you stray into a bus lane, or park for too long, or park in the wrong place, you will get an official notice that’s as challenging a read as you can imagine. 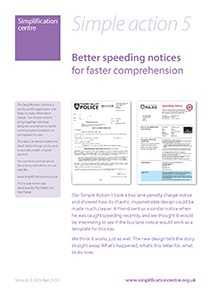 This report demonstrates how basic principles of simplification can make these notices much easier to understand.